The NAMM Show. Gotta love it. Where else can you check out loads of beautiful instruments, see fabulous musicians play and then hang with all your favorite industry peeps. Nowhere! You don't have to go down to the crossroads to get vintage-style blues sound any longer. The new LH-204 Brownstone from The Loar delivers a dark and meaty tone that's perfect for the blues. 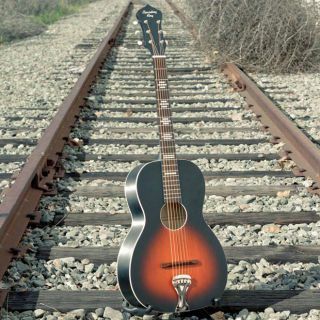 The Loar has introduced the LO-215 and 216, two small-body single-0 guitars with a 25.4-inch dreadnought scale length. The street prices for these models start at $389.99.